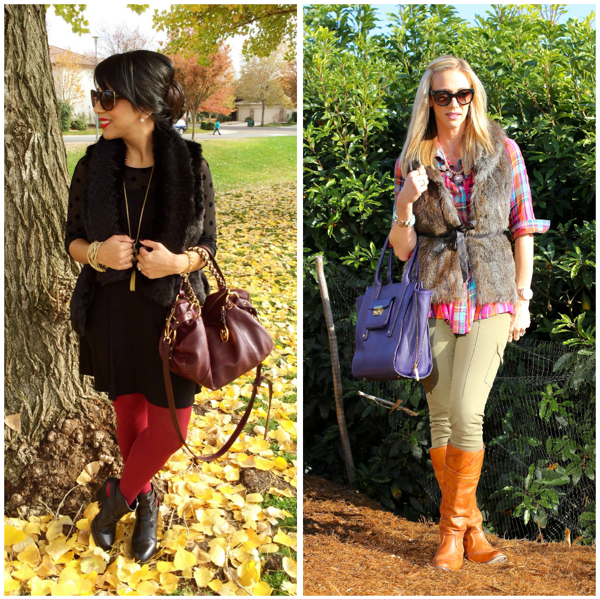 Today I am teaming up with the gorgeous Renée from Let's Talk Fashion to show you how we are wearing one of falls hottest trends, faux fur vests. I am so excited to be collaborating with her as I always love to show you beautiful readers how each of us puts our own spin on fashion and styling. I love that Renée paired her black fur vest with a beautiful polka dot top and the red tights to add the perfect pop of color and yet keep her look sleek and chic. And can we just talk about her burgundy handbag, um gorgeous! I love that she is always so put together with classic, polished and on trend style making her one of my favorite daily reads. Please pop on over to her blog Let's Talk Fashion to say hello and check out her fun, fashion tips as her heart is similar to mine with an extreme love and passion for fashion. 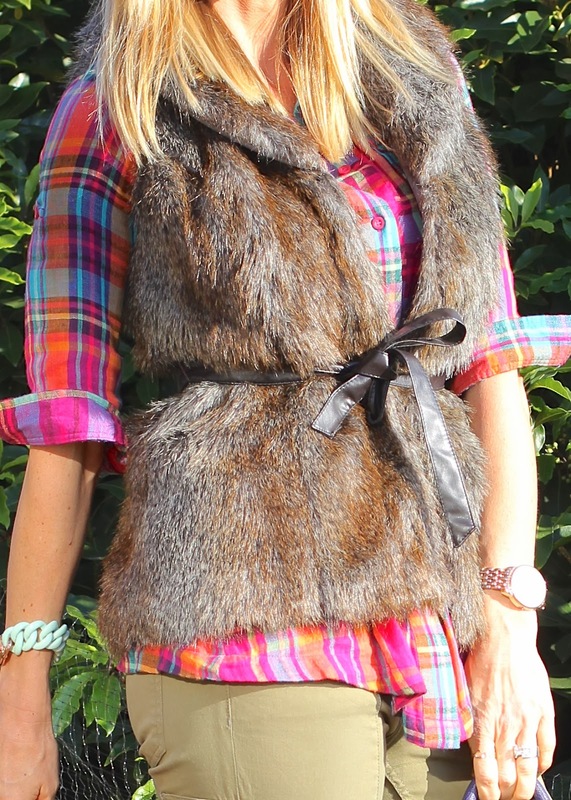 With my fur vest, I decided to pair it with another favorite of mine PLAID! You all know I love a good plaid and when I say good, this one is an oldie but goodie. I have had her for years. I am beginning to think I am a clothing hoarder. No, just kidding. OK maybe a little… I had picked up these skinny cargos awhile back ago at H&M in the store and let me tell you they are super comfy and stretch. Make sure to go down a size as they bag out a little. Do not fear the initial tightness I promise they will relax a bit. Faux fur vests are a huge hit this fall/winter season. You can pretty much find them anywhere, and as friendly as your budget allows. Remember faux is the key as we all love our little animal babies and faux looks just as nice. Above, I wore mine with the belt and tied it, sometimes I remove the belt or other times I will add a completely different belt. Remember to have fun with it. I love that my friend Renée dressed hers up and mine is a little more casual. It really shows the versatility of this style and lets you know they look good either way. I definitely think they add a wonderful punch to an outfit. 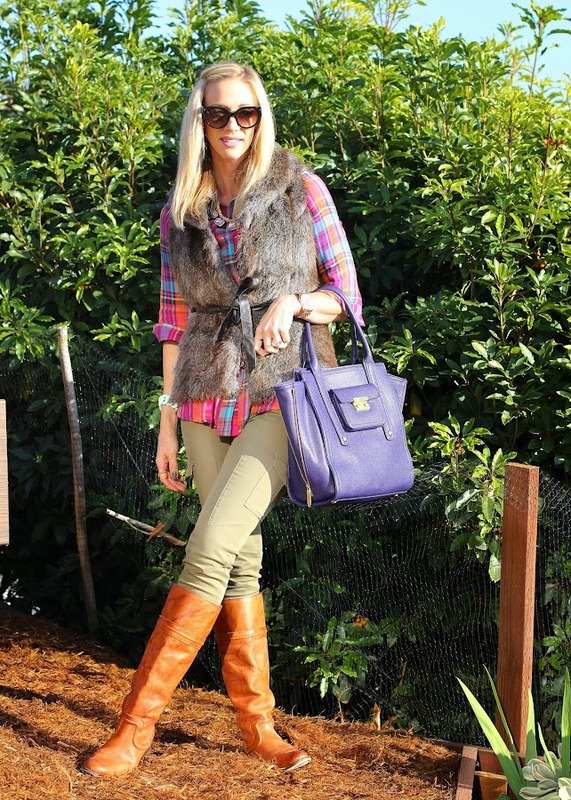 Are you wearing a faux fur vest this fall yet? I would love to hear! Do not forget to stop by Renée at Let's Talk Fashion and say hello!!!! you will be contacted via email. Thank you all who participated! Aww I am so happy that you like it. It really was fun and came out great!! Yes we love our little Chi babies and I could never wear real fur eek! I ordered the PL bag online that morning they launched and skipped going to the store. Our stores here were wiped clean in minutes. I would have loved to grab a black one or the little mustard colored one but I am grateful I even got "A" bag lol. Thanks again girl! Talk soon!!!! I totally love the plaid and fur combination... so woodsy and chic. :) You both look fabulous... I'm checking out her blog right now actually! Thanks for sharing.